Over the last decade and a half, I've been fortunate to train under a variety of martial arts instructors - some well-known, others completely unknown. I've been especially fortunate since all of my instructors have been completely open to discussing their methods and techniques in a critical fashion (some instructors find it disrespectful to question how their technique works or why it may not work etc). I learnt early on that while the views of effective individual techniques vary from person to person, all of my instructors agree on three basic physical facets that are required to progress in the martial arts. In fact, the vast majority of my instructors all used the same analogy to describe these three facets - The Triangle Hypothesis. In their words, each corner of The Triangle represents one of these facets. There is Technique, Power, and Speed (bear in mind, that these are the basics, so aspects such as 'Flexibility' would fall under Technique, whilst 'Explosive Force' would fall under Power etc.). Each facet is interconnected - Improving any one corner has the potential to improve any other corner (for example, if you improve your technique - power and speed are likely to increase as a result). 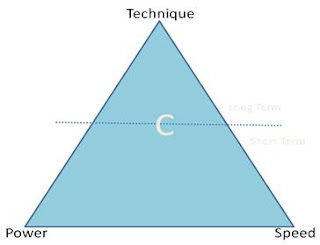 In order to grow as a martial artist, you have to make your triangle bigger. That is, you have to improve your Technique, Power, and Speed. Improving any one aspect will help you, but in the long-run, it may leave you unbalanced. So why does everyone say that Technique is the most important of these three aspects? The reason is this: Technique is the base of your martial arts training. Speed and Power will help you progress tremendously, but in the long-term - speed and power will decline (more so for some than others) and there is only Technique that remains (included here, is Knowledge and Experience). As a result of my own experience, I've humbly chosen to add 'C' to the centre of my Triangle. C stands for Cardio/Conditioning - I feel that this is crucial (also starts with a ‘C’....alliteration...nice.) because as you tire, your technique deteriorates, it becomes harder to generate power, and your body begins to slow down. How you develop your own Triangle is up to you. No doubt, your instructors and training partners will have an impact on how you grow but ultimately, it is you who decides. Consider this whilst examining your goals in the martial arts. What kind of triangle is best suited to you and your goals? Congrats on an excellent article! It was very interesting and I'm surprised i've never come across this before.